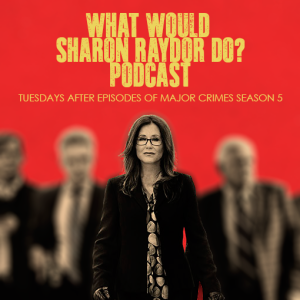 Welcome to Episode 12 of the “‘What Would Sharon Raydor Do?’ podcast, the podcast devoted to getting an in-depth view at Major Crimes Commander Sharon Raydor by the woman who knows her best, Mary McDonnell. Recorded with Mary McDonnell. Guest host this week Mina Sharpe, editor of MajorCrimesTV.net. Mary comments on the recent announcement that the upcoming season (season 6) will be Major Crimes last. Mary and Mina discuss some of Sharon’s experiences on last season, and what is ahead for Season 6. FEEDBACK/QUESTIONS: Ask your questions by tweeting with the hashtag #WWSRD, Commenting under each podcast on Facebook, or on MajorCrimesTV.net. Have a Major Crimes or Mary McDonnell fan in your life? It would be awesome if you shared this podcast with them! Share on Facebook or Tweet some love! If you love the podcast, subscribe on soundcloud or iTunes and never miss an update! This entry was posted in MCTV Exclusive, WWSRD and tagged WWSRD by admin. Bookmark the permalink.